Quick Step Floors (UCI: QST) is a cycling team led by Patrick Lefévère, manager of UCI World Circuit in Belgium. 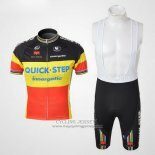 Made of 100% polyester, Quick Step Floors cycling jerseys is lightweight, breathable, odor resistant and UV resistant. Modern reflective signs will make you more visible in the low visibility environment. 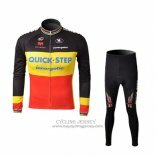 Welcome to buy Quick Step Floors cycling jerseys.